Last week I found on kde-apps.org a new interesting package: kdbus. It's a KDE application to discover D-BUS services on the system and session bus and call found methodes. This is the same as kdcop for DCOP. I added the package to the SUSE build system and it was approved for production on the next day - really fast, thanks to Andreas Jäger - and is now available on factory and the next release. 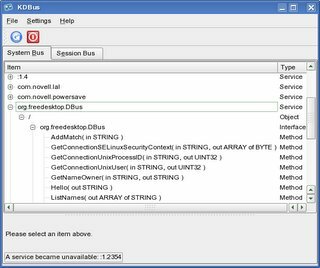 By testing the package I could see that currently only D-BUS itself is full supported for introspection via the bus. I'm not sure if the other services are broken or only not support introspection. In case of HAL and also powersave I could not found any introspection code in the source. So I think we should add at least to powersave the related methodes and the needed xml file with the description of the available services, methodes and signals from the powersave daemon. Btw. the application is very usefull if all services would implement intospection also If the GUI need some fixes and improvements because currently resize the GUI did not work so well.